This past weekend we took our millionth (seems like) trip to Raleigh (well Morrisville) to welcome home my brother Michael from his mission (the Denver Colorado North Mission). When he left I was 4.5 months pregnant with Amelia. Now Amelia is 19 months old and I'm 6 months pregnant with #2. So much the same, so much different. It was great to see him again and it was really fun to have my big fat family back together again, if only for a short time. My brother Eric's papers went in last Friday and he'll probably be at the MTC before the end of the year. Hmm, wonder if I'll be pregnant when he gets home? This pictures was taken with a self-timer camera. Yes that is my sister's dog in the photo. Apparently I'm in the minority when it comes to thinking family photographs should only including humans. Love you Catherine! 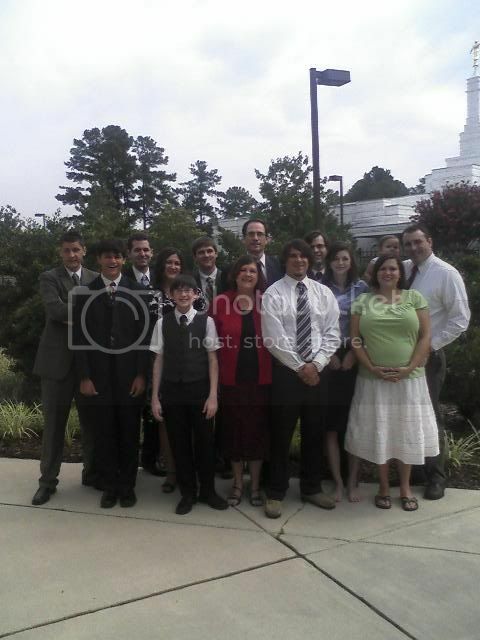 Back row L-R: Mary, Christian, Eric, Amelia, Catherine, Sydney (the dog), Bryan, Michael, and Daniel. Front row L-R: Alex, Mark, Mom, Dad, Erik, and me (Elizabeth). I'm not sure how I ended up in the front on both pictures, but I don't like it. 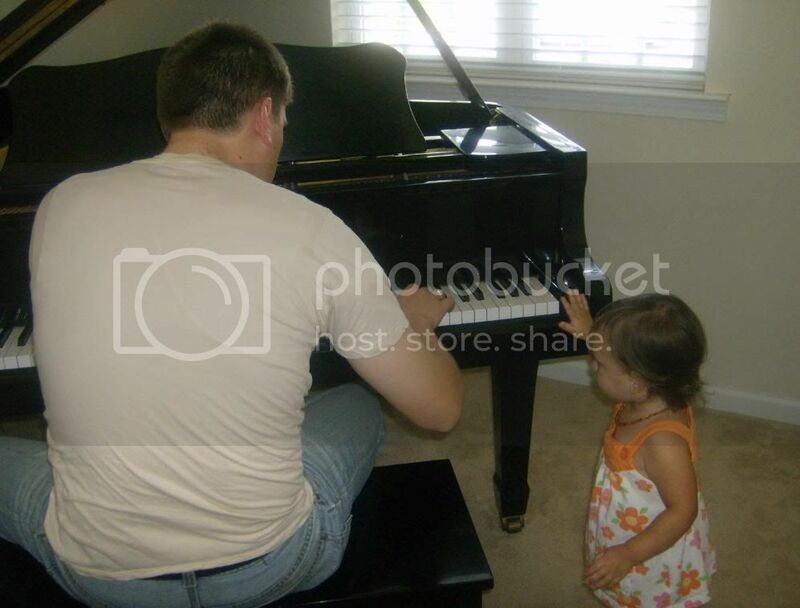 Uncle Michael and Amelia sharing their love of the piano. Sometimes I forget that you have such a large family because I only know about half of you. You are all so grown up. Where was Michael? So many Plautzes (I never did know how to pluralize my former last name), so little time. 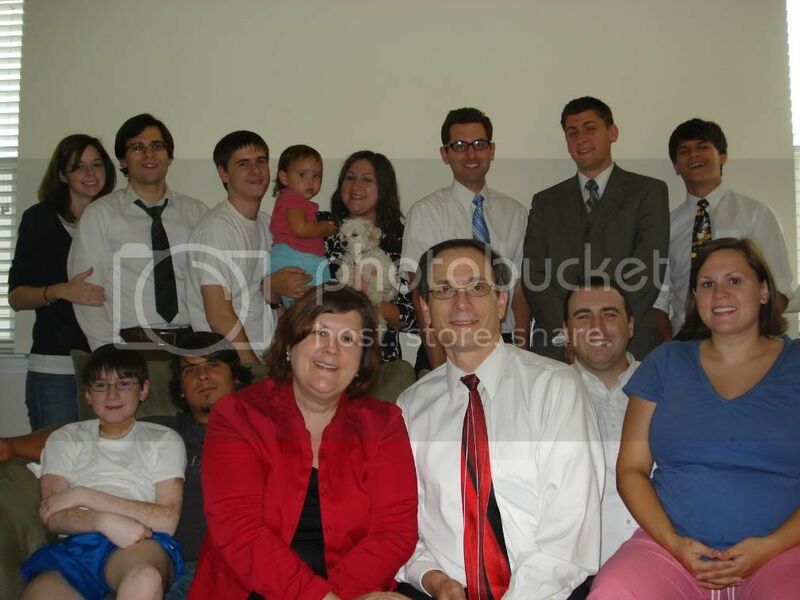 I edited the post to include that Michael was in the Denver Colorado North mission. The only reason Sydney was there was so Amelia would be okay. I suggested that she help me hold her to stay still. She's apart of the family too, but yes, some pictures should not include animals. She won't be there when the "real" picture is taken!